RIP Eddy Choong – you will be missed! Malaysia’s Datuk Eddy Choong, who passed away yesterday, aged 82, in Penang, was one of the great characters of world badminton. Standing at just 5’4″, Choong had a bunch of nicknames that conveyed the sort of player he was. 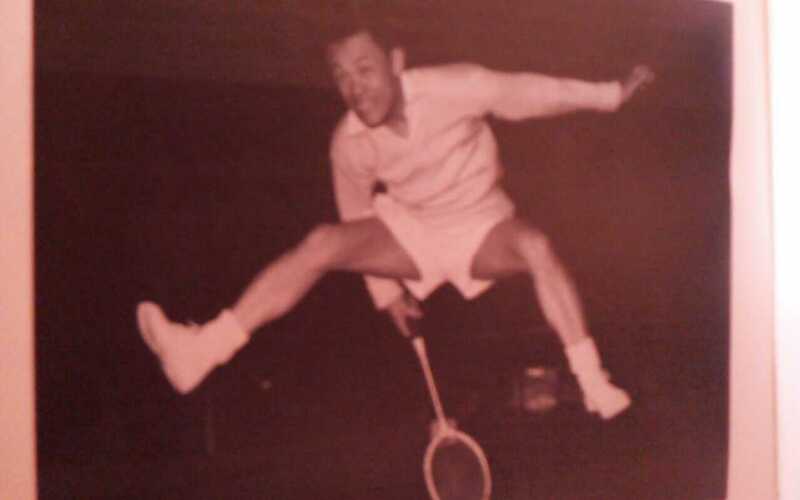 Called variously ‘The Pocket Prodigy From Penang’, ‘Pocket Rocket’, ‘Mighty Midget’, ‘Mighty Atom’ and ‘Jumping Jack’, Choong took over the mantle of the world’s best player from countryman Wong Peng Soon by winning the All England in 1953, 1954, 1956 and 1957. He also won the doubles three years in a row from 1951 to 1953. Overall, he was in 12 finals, and was undeniably one of the all-time greats. He was also a member of the Thomas Cup-winning team, in 1955. But it was not just in his tournament victories that Choong was renowned as a character. His explosive style of play, despite his short physical stature, led some to suspect that he had springs hidden in his shoes. He and brother David arrived in England to study law, but Eddy took eight years to complete the four year course, because he spent the winter months playing tournaments every weekend. What was unique about Eddy was that he had interests apart from badminton. He raced cars and crashed them frequently; upon retirement he started breeding Doberman Pinschers. At school, he was an excellent athlete, gymnast, rugby and football player, and he would often study other sports to see what he could use in badminton. For instance, having suffered a loss to the wily Wong Peng Soon in the All England final of 1955, Choong spent time thinking of what had gone wrong. Peng Soon had a terrific backhand, with which he could play all kinds of strokes, and the backhand was an attacking option. Choong realised that clearing to his backhand was only aiding Peng Soon, and so he used a tactic that strikers use while confronted with an onrushing goalkeeper – go straight instead of the angle. Instead of clearing to his backhand, Choong chose to clear deep down the centre, from which Peng Soon could not surprise him with his angles. The final of the Selangor Open that year thus went Choong’s way. His interests in other facets of life made him an absorbing person to listen to. He drew examples from a wide variety of subjects. To him, a sportsman had to be modest – for he was but a shooting star, destined to light up the sky briefly before disappearing from it. Unlike most badminton champions in subsequent years, Eddy Choong saw his performances in badminton as a way of showing that all races can be equally good at sport. His overall record – believed to be over 500 titles – is an astonishing record, and unlikely to be matched in an age when its biggest champions talk of exhaustion despite playing only a dozen tournaments a year. They should learn from Eddy Choong – during the winter months in England, he’d play 20 tournaments in 24 weeks. 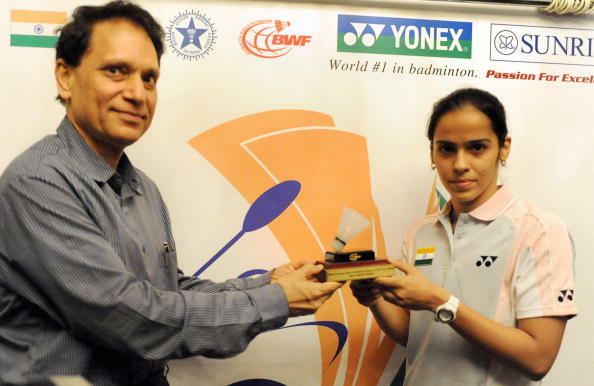 Saina Nehwal receives the “Eddy Choong” Most Promising Player-2008 Award from the president of the Badminton Championship 2009, V.K.Verma during the unveiling of the Yonex Sunrise World Badminton Championship. The Badminton World Federation recognised Choong’s contributions by instituting a prize in his honour: The Eddie Choong Player of the Year award (modified to Eddie Choong Most Promising Player of the Year since 2008). Among its winners are names like Peter Gade, Camilla Martin, Taufik Hidayat and Lin Dan. Eddy Choong was hugely popular in India; the badminton-crazy Bombay crowd had taken a shine to him, even though he beat their favourite Nandu Natekar convincingly. He would partner Natekar in the 1984 All England to win the Veteran Doubles, 33 years after he’d won his first title at the world’s greatest tournament. Eddy Choong will be missed. He was from a generation that set the tone for how badminton should be played: in the highest spirit of sportsmanship and athleticism. He has left a legacy that will be hard to emulate for all current and future players.